The purpose of this document is to present an overview of the trends observed between 2001 and 2016 for the French language and the official language minority populationNote 1 in Newfoundland and Labrador. To this end, it provides census-based information on the population who reported having French as their mother tongue, French spoken at home or used at work, French as their first official language spoken as well as for those who speak French well enough to sustain a conversation. growth, calculated using number and percent units of measure (appearing as column headers). Sources: Statistics Canada, censuses of population, 2001, 2006, 2016; 2011 National Household Survey. In 2016, 25,970 people reported being able to conduct a conversation in French, either exclusively or together with English. Collectively, they represented 5.1% of Newfoundland and Labrador’s total population. The population able to conduct a conversation in French, either exclusively or together with English, has grown by 23.9% since 2001, or 5,005 people. 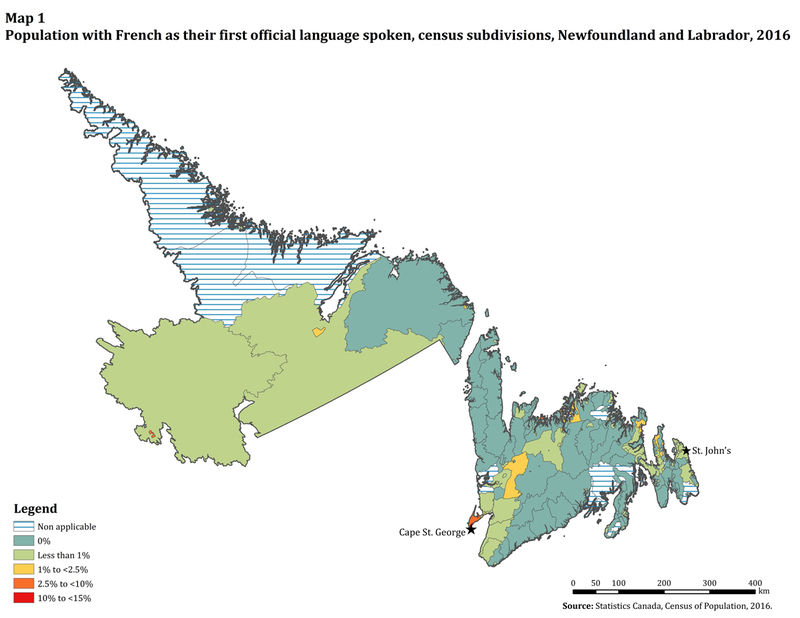 In 2016, 25,850 people in Newfoundland and Labrador reported being able to conduct a conversation in both English and French, up 24.2% since 2001. For the 2016 year, the English-French bilingualism rate stood at 5.0%, up 0.9 percentage points since 2001. In relative terms, 94.8% of the official language minority population reported being able to conduct a conversation in English and French in 2016. By contrast, this proportion stood at 4.6% for the rest of the population. Among the official language minority population, the number of persons who report being able to hold a conversation in both English and French has grown by 265 and increased by 1.7 percentage points since 2001. Among the rest of the population, English-French bilingualism grew by 4,760 people or by 0.9 percentage points over the same period. This map shows the proportion of the Official Language Minority Population found in each Census Subdivision in Newfoundland and Labrador in 2016. In this map we use six distinct colours to signify different values. Blue stripes are used to represent areas for which no data are available. There are 18 Census Subdivisions in this group. A solid teal colour is used to represent areas in which no one of the Official Language Minority Population resides. There are 250 Census Subdivisions in this group. A solid green colour is used to represent areas in which the Official Language Minority Population constitutes less than 1% of the total population. There are 73 Census Subdivision in this group. A solid yellow colour is used to represent areas in which the Official Language Minority Population constitutes between 1% and less than 2.5% of the total population. There are 24 Census Subdivisions in this group. A solid orange colour was used to represent areas in which the Official Language Minority Population constitutes between 2.5% and less than 10% of the total population. There are 6 Census Subdivisions in this group. A solid red colour was used to represent areas in which the Official Language Minority Population constitutes between 10% and less than 15% of the total population. There is 1 Census Subdivision in this group. This table displays the results of Data Table. The information is grouped by Census Subdivision (appearing as row headers), Official Language Minority Population, Total Population and Official Language Minority Population , calculated using percent units of measure (appearing as column headers). Source : Statistics Canada, Census of Population, 2016. In 2016, Newfoundland and Labrador’s official language minority population reached 2,330 in number. This figure represented 0.5% of the province’s total population that year. These levels are the highest the province has seen in both absolute and relative terms since at least 2001. During the 2001-2016 period, the official language minority population grew by 11.5% which translates to an additional 240 persons over that period. However, this growth was not linear. In fact, there was at first a decrease between 2001 and 2011 which was then followed by an increase between 2011 and 2016. In 2016, Newfoundland and Labrador’s official language minority population ranked last in regards to their relative size (0.5%) in comparison to all provinces and the territories, behind Saskatchewan (1.3%) and British Columbia (1.4%). The official language minority population is defined according the first official language spoken. The 'English-French' category is equally redistributed. Includes all persons who reported French whether with or without additional languages. Refers to Part A of the language spoken at home and language used at work questions, the language spoken or used most often. Refers to those aged 15 years and over who worked at least once between January 1st, 2015 and Census Day. In 2016, 2,900 people reported having French as their mother tongueNote 2, either exclusively or together with another language. They represented 0.6% of Newfoundland and Labrador’s total population, which is the highest level the province has seen in 15 years. In the 15 years leading to 2016, the number of persons with French as their mother tongue, either exclusively or together with another language, rose by 390 persons which amounts to a 15.5% increase over that period. This table displays the results of Data table for Chart 1 2001, 2006, 2011 and 2016, calculated using percent units of measure (appearing as column headers). Includes persons who only speak French most often and no other language regularly. Includes persons who speak French most often and at least one other language regularly. Includes persons who speak French most often equally with another language. Includes persons who speak French regularly in addition to the main language. In 2016, 4,305 people reported speaking French at home at least regularly (most often or as a secondary language). As a whole, they represented 0.8% of Newfoundland and Labrador’s population. During the 2001-2016 period, the population who reported speaking French at home at least regularly (most often or as a secondary language) rose by 1,245 persons, up by 40.7% in 15 years. In 2016, 920 people reported speaking primarilyNote 3 French at home, up 4.0% since 2001. However, their proportion remained unchanged at 0.2% of the province’s population compared to 2001. The largest increase in the number of persons speaking French at home was observed among those who speak French regularly as a secondary language in addition to the main language. They increased from 1,960 in 2001 to 2,940 in 2016, up 50.0%. Further, the population who speaks French equally with another language most often at homeNote 4 increased from 215 in 2001 to 445 in 2016. The number of persons using French at work at least regularly (most often or as a secondary language) reached 4,130 in 2016. As a whole, they represented 1.4% of Newfoundland and Labrador’s working population. In the 15 years since 2001, the number of workers who use French at work at least regularly increased by 36.1%, or by 1,095 workers. Although the number of workers who use primarilyNote 5 French at work increased from 700 in 2001 to 950 in 2016, their proportion has remained unchanged at 0.3% of the working population. Of all workers using French at work at least regularly, the largest increases in number were observed among those who use French regularly as a secondary language in addition to the main language at work, rising from 2,105 in 2001 to 2,705 in 2016. In addition, the number of people who report using French equally with another language most often at work grew from 230 in 2001 to 475 in 2016. In this document, the official language minority population is defined according to the criterion of the first official language spoken. The ‘English-French’ category is equally redistributed between the ‘French’ and ‘English’ categories. In some cases, the number of respondents whose mother tongue is French is higher than the number given for the official language minority population. As part of the logic used to derive the official language minority population based on the first official language spoken variable, those who may have French as their mother tongue but can no longer speak it well enough to hold a conversation are not included. Similarly, those who can hold a conversation in English and French and have these languages as their mother tongue but speak English most often at home are likewise excluded from the French-language population. Primary use of French at home refers to French spoken exclusively or most often. Includes persons who reported speaking French equally with another language at home with or without additional languages spoken regularly as secondary languages. Primary use of French at work refers to French used exclusively or most often.